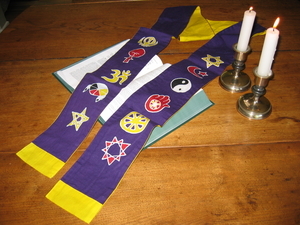 Our purple Interfaith Stole measures 4” x 6’ in length and features the symbols of 12 major religions in different colors on a purple and gold background: evoking a cool, calming effect which lends itself to a quiet, reflective mood. Purple is the color closely associated with penance and healing. A colorful and vibrant vestment, this wonderful cotton garment is appropriate for those celebrating a wide variety of rites of passage. Our purple Interfaith Stole is handmade in Bali and is popular among clergy, ministers, deacons, hospice workers, post-secondary Religious Life offices and many more who support and live diversity. The faiths represented on this Interfaith Stole include: (top right) Judaism, Islam, Tao, Jain, Buddhism, Baha’i; and (top left), Christianity, Sikhism, African Goddess, Hinduism, Native American and Wiccan. 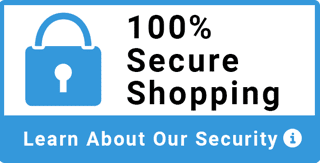 For a more detailed description of our stoles, as well as care and handling instructions, click here.